Why Do I Keep Tripping Circuit Breakers? There are a lot of opinions that are arguable out there. If you’ve ever stumbled into the comments section on a popular website, this is probably obvious to you. That being said, there are certain opinions that no one can or would really argue against. The fact that electricity is an incredible resource in our homes, for instance. Unless you’re entirely off the grid, which relatively few people are, you depend upon the electric utility in your area for access to the electricity that you use. Unfortunately, while your utility may be quite reliable, there are still plenty of ways in which you may run into trouble when using electricity in your house. Because electricity can be dangerous when it is not being used correctly, any such problems really do demand your immediate attention—and that of a professional electrician in Norfolk, VA. Today, we’ll look at the common problem of tripped circuits. Resetting a tripped breaker isn’t hard, but it’s not something you should be doing regularly. A circuit overload occurs when you are trying to draw more current from a circuit than it is meant to carry. A lot of homeowners wind up doing this because they buy strip outlets and load them up with a lot of different electronics or appliances. If this is the case, cut back on your draw, relocate some items to different outlets, and see if that helps. Any major appliances should also be running on their own circuits. A short circuit occurs when your hot wire touches another hot wire or a neutral wire in an outlet. That causes a surge in current flow, overloading the circuit. You may hear a pop or even see sparks if this happens. Faulty wiring, including wiring that was incorrectly completed, is a serious fire risk. Do not ignore such problems. You may also be running into a ground fault, meaning that a hot wire is touching either a ground wire or the surface of a metal box. This is of particular concern in areas where moisture is present. Installing GFCI outlets in such areas is advisable. When you need electrical services of any kind, you need licensed, experienced electricians to do the job. That means working with our team. 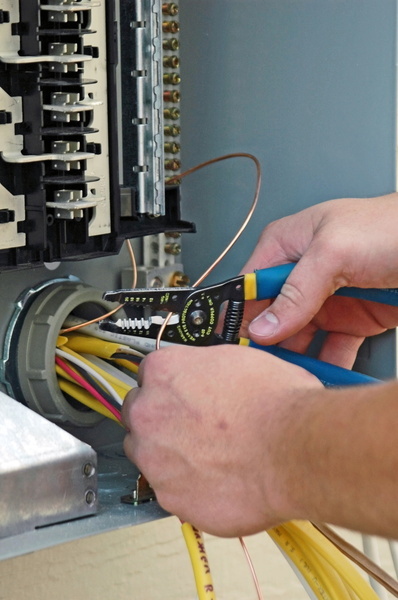 We’ll make sure that your wiring is in great shape, that the wires themselves are not compromised, and that your electrical system is set up to meet your demands. You need to be able to use electricity reliably in your home, but safety is always the number one priority. Do not make any compromises with your electrical system or its breaker box. House Call Company is here for your electrical service needs. Contact us and see how we can make you smile. Posted in Electrical, Uncategorized | Comments Off on Why Do I Keep Tripping Circuit Breakers?